Enjoy the views while relaxing at the bar, dining room table, or kitchen nook. Open floor plan from kitchen to living room where there is plenty of comfortable seating, large screen TV, and picture window over the water. Large grass yard with room to play or visit. Across the street a paved pedestrian trail follows the waterfront into town. The house is pet friendly and includes a dog run out the back door, a spacious laundry next to the kitchen, and off street parking for three cars. Originally from rural South Dakota, I've been a resident of the Puget Sound area since 1977 where I've owned and operated an industrial business for 20 years. My home is in nearby Steilacoom. I love the location of this home, with the daily cycle of foot ferry running from Port Orchard to the Bremerton terminal and the big ferry going to and from Seattle. Open the window or step outside and you'll hear the gulls and see the flocks of ducks on the water. You will often hear sea lions from across the bay and always the scent of salt water. I enjoy bicycling and this house sits right on one of my favorite routes. Indeed, it is a popular year-round biking destination because of local waterfront and rural paved roads. The location makes the house a great hub for day trips. The local foot ferry is about a mile and a half away and it travels all day Monday through Saturday to the Bremerton ferry terminal. There's live music on weekends just a couple blocks away at the Blue Goose and good restaurants within walking distance. All new sheets, blankets, and towels. Off street parking for three cars, four if you have smaller rigs. The kitchen bar seats three and the kitchen nook, with its bar height table, seat two or three. Small selection of videos for children and families. Too many darn steps. Sorry. Great hub for day trips to Seattle via ferry or car, to fantastic waterfront biking roads (the owner is a bicycler), a couple hours from mountain hikes, Hurricane Ridge, excellent golf courses, kayak surfing and rock gardening (owner is also a kayaker). A paved walking trail to downtown Port Orchard starts right across the street. Fun property with an amazing view of the local marine traffic. Comfortable and cozy with quiet neighbors. Location was great and convenient. Older home creaked when walking and beds were very uncomfortable. Stairs going up to house was uneven and not lit at night. Refrigerator was small, dishwasher not secured and bearing on clothes washer was super loud. Some windows did not have blinds and bathroom window could not open. TV viewing was difficult for someone who doesn’t have any internet streaming accounts. Andy was great and the price was good. Some TLC and attention to this home would make it a real gem. Great house on the water! This house is exactly as described. My husband and I spent 4 nights here with our dogs. The location is BEAUTIFUL, and I can't say enough great things about the island of Port Orchard. We spent more time than we originally intended on the island, simply because we enjoyed the house and the area! It is quiet and comfortable and you can EASILY get to the ferry dock and so many excellent local places to eat. We would love to return to the area in the spring and try to stay at this gem again! We stayed in the house awaiting closing on our new home purchase and could not have been happier. This house has wonderful views and is close to everything that you would need. Andy was very accommodating as we needed to extend our stay for one night. If you are looking for a great value and nice house, look no further. Thanks Andy! My husband, dad and I enjoyed a visit to the Bremerton Wa area last week. 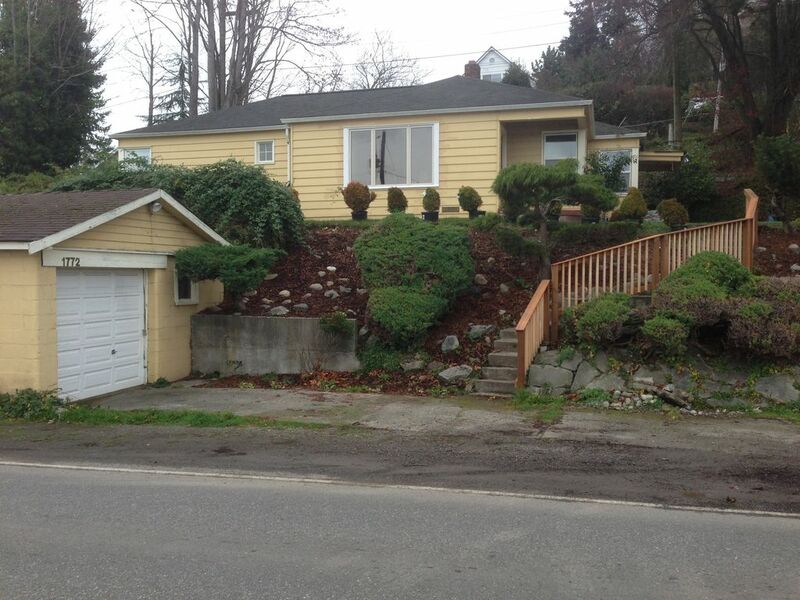 We enjoyed the home in Port Orchard, close enough to my daughters home in Bremerton. The house is very clean and comfortable. The view is great. We are from the central valley in California so I love to stay by the water whenever possible. My dad and I took a fun ride on the foot ferry to Bremerton where we enjoyed a nice lunch with my husband at Anthony’s. Sleeping was great. Nice cool breeze. I definitely would like to stay here again and highly recommend this rental. I really appreciate a spotless, clean rental! There were extra towels which was a plus and the walls were pretty sound proof. Our friends had a baby with them and when the baby cried, we couldn't hear it at all. Huge plus! The only hang up I had was that I had to call to find out how to get into the house. It was cutting it really close to check in and I still hadn't heard anything. But they pulled through and there were no issues. Exceptional area for waterfront biking. Just 40 minutes by bike to Manchester Park with stunning views all the way. The local foot ferry delivers you to the Bremerton/Seattle ferry (drive on or walk aboard), which travels to downtown Seattle just two blocks from Pike Street Market, downtown shopping, Seattle Art Museum, Benaroya Hall, theater. If you kayak or surf try Crescent Beach just a couple hours away on the Hood Canal. For stunning mountain views drive 90 minutes to Hurrican Ridge and relax at the visitor center or do an easy hike. Property damage protection may be waived for shorter stays and replaced with a higher refundable deposit.